This week’s meeting at Schloss Elmau may not have produced many tangible results, but it did offer yet another display of the power German Chancellor Angela Merkel currently wields in Europe. When Schloss Elmau was established a century ago in the Alpine foothills south of Munich, it prided itself as a discreet retreat for German artists and, later, industrial families. It was known for its flat hierarchy, with guests and staff mixing freely. Elmau was where gold-diggers hoping to snag rich heirs worked the season as waitresses, called Saaltöchter. Though much of Elmau’s atmosphere went up in smoke with half of the original building a decade ago, I couldn’t help thinking of the Saaltöchter’s ghosts as I watched Angela Merkel there last weekend. Like many Saaltöchter, the German leader sidled her way into the world’s highest echelons through a mix of wile and opportunity, but has remained there through skill and hard work. When she entered politics in 1990, she could never have held her own against the public school polish of someone like David Cameron; now, after a quarter century in politics and a decade in the chancellery, Merkel – and not the British prime minister – is the crucial player in Europe. Like many women not born into power or wealth, she had to overcome establishment skepticism before she could wield influence and power. In Elmau, however, she had to work hardest to play down her dominance, making sure every leader headed home with something. A Bavarian breakfast of sausages and beer with US president Barack Obama had a dual purpose: it helped ease the strain in Berlin-Washington relations, but also underlined how she has become the White House go-to person on the continent. Cameron’s introspection over Britain’s EU future will occupy him for some time to come, and his priority in Elmau was not Greece or the climate but tackling FIFA-style corruption. Merkel got Obama to talk tough on Greece and, in return, she vowed to keep the EU together on Russia ahead of a European vote on extending Russian sanctions. On EU trade talks she assured her guests – in particular the US president – that she would not let Europe fall behind the Asia-Pacific in securing a trade deal with Washington. Meanwhile, French leader François Hollande, in recent months little more than Merkel’s “plus-one” in talks with Russia and Greece, was delighted at the prospect of G7 momentum for the Paris climate talks. 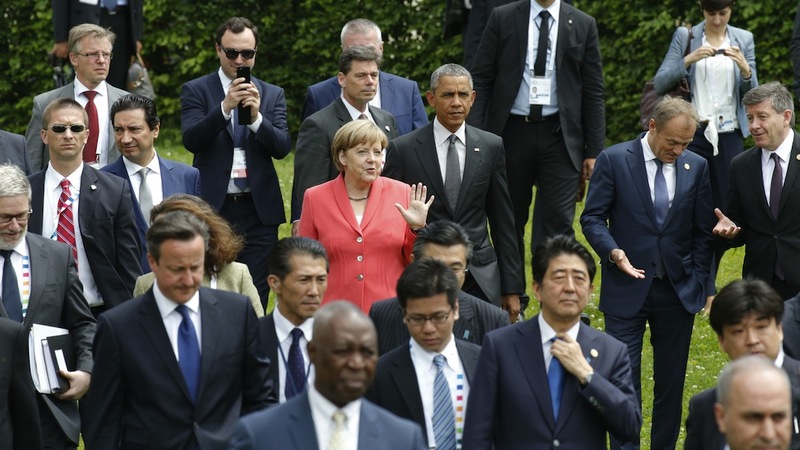 True to the Merkel method, the final G7 climate communiqué was an incremental agreement. It promised to “decarbonize” the world economy in the coming decades, something that could either be another Merkel fata morgana on climate change or a crucial landmark ahead of the meeting in November. But as the G7 rolled up its high-security tent for another year, Germans in Bavaria had mixed feelings – about both the event and its hosts. Though flattered by praise for their flawless organization, some Germans cringed at the beer and lederhosen images sent around the world from Merkel’s Sunday breakfast with Obama. Hollande, one German commentator argued, would never surround the US president with Frenchmen wearing berets and strings of onions. And while avoiding the riot imagery once synonymous with G7 meetings was a triumph for German organizers, it was achieved by swamping the region with police, banning protest camps on public land, and reportedly leaning on local farmers to refuse similar requests. With 20,000 federal and Bavarian officers on duty in riot gear everywhere you looked, the G7 turned this pretty corner of Bavaria into a ghost town. The five-to-one police-to-protestor ratio drew unfavorable comparisons to the teacher-to-child ratio at German kindergartens. It’s unlikely the Bavarian G7 summit will be remembered for its news value. But should future historians seek a picture of Angela Merkel at the peak of her power, they could do worse than to use one of the carefully-choreographed images of Angela Merkel from last weekend, Elmau’s last Saaltochter.